Is that such a place? If so, that is where I have been for the last couple of weeks. Tomorrow (well I guess today actually) is McKenna's 2nd birthday party! I am so excited and have been up way past my bedtime multiple nights in a row. I even hit a new record on how many days I went without washing my hair. I have been busy busy over here and I can't wait to share everything with y'all! 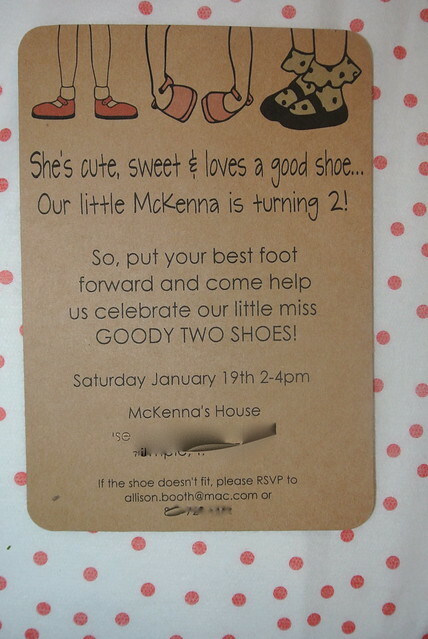 The theme for her party is Goody TWO Shoes. The girl has always loved shoes so it was perfect. Here is the invite I made. I promise I will be back so soon with party pics! I love that invite! SO DARLING! Adorable! I cannot wait to see the party! Do you come up with all of this creativeness yourself?? ?